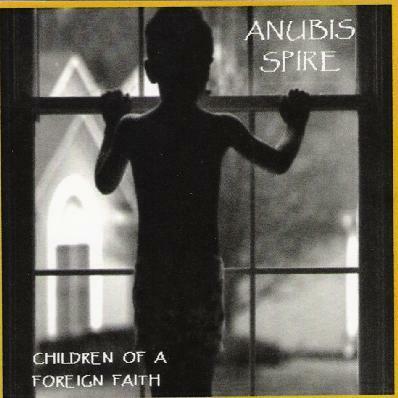 Anubis Spire - "Children of a Foreign Faith"
It's been a long time since the last Anubis Spire album. A couple years ago they released Back to Abydos, a collection of singles and previously unreleased songs. But prior to that the last proper album was Old Lions (in the World of Snarling Sheep) back in 1998. Still with the band are Bill MacKechnie on guitars and vocals, Tim Costley on bass and Mick Loher on drums, plus newcomer (since the 1998 album anyway) David Sweet on keyboards, whose own music I had written about waaaaaay back in AI #4. Anubis Spire play melodic, accessible progressive influenced hard rock, often with a metallic edge and occasionally psychedelic. The album consists of 16 tracks, every one of them well composed songs and lyrics and the album includes loads of killer guitar from MacKechnie. Among the highlights is "I Have Been Waiting", a hard rock and symphonic prog song with chunky metal guitar and ripping solos. MacKechnie is really an amazing guitarist and I'm glad to see that he's still practicing the restraint he did on the Old Lions album so many years ago. Mind blowing playing that colors and adds fire to the song rather than dominating it. "Not Even a Day" and "All Perception is Wrong" are both excellent metal and prog influenced hard rock tracks that really stretch out and develop. Outstanding anthem like melodies and catchy riffs that hook you hard and are given frequent power-ups by MacKechnie's passionately fiery fretwork. Image if Dave Gilmour and Steve Hackett were HARD rock guitarists and you might get something like MacKechnie. The title track is a real highlight, being an acoustic fused rocker characterized by that special blend of hard rock and prog that Anubis Spire excel at. Great song, accessible, but with an underlying compositional and instrumental sophistication that makes it downright enchanting. "Adrift" is a brief piece that is ambient but intense, and serves as a solid intro to "Tombs on the Hill", which roars out of the starting gate as a molten metallic rocker with oodles of screaming meltdown guitar. "You're So Beautiful (The Music Biz Song)" is a little different, having a kind of 60's vibe, with a little country psych rock, but still with the prog styled keyboards. Very cool. "Eternal Resonance (Part Two)" is a brief trippy raga psych instrumental that leads into the psychedelic-ambient-jazzy "Waterline". And "Remember Me?" and "Walking the Wire" are standout songs that showcase Anubis Spire's strong Pink Floyd circa late 70s influence. An all around excellent album. I hope we don't have to wait as long for the next one. For more information you can visit http://cdbaby.com/cd/anubis3. For lots of sounds files from earlier albums check out: http://www.soundclick.com/anubisspire.